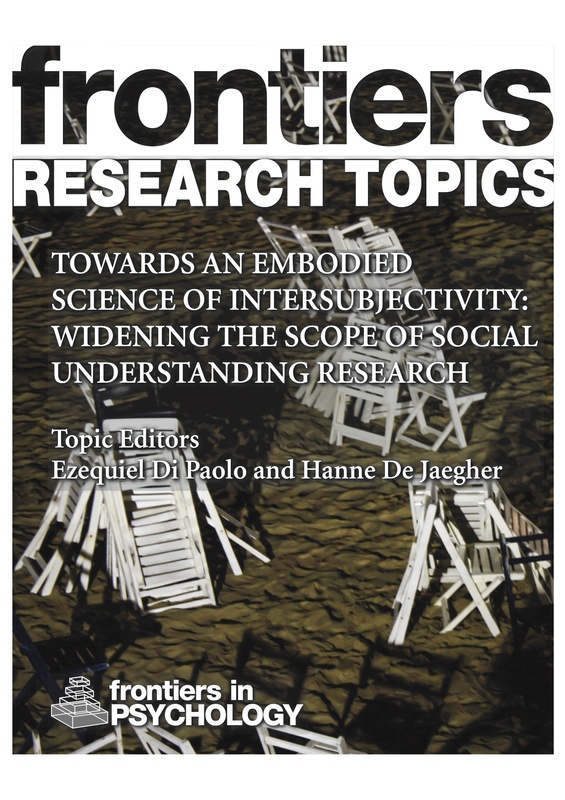 Towards an Embodied Science of Intersubjectivity: Widening the Scope of Social Understanding Research, edited by Ezequiel A. Di Paolo and Hanne De Jaegher, Lausanne: Frontiers Media, 2015. A Frontiers in Psychology open access ebook based on the 42 contributions to a Research Topic. An important amount of research effort in psychology and neuroscience over the past decades has focused on the problem of social cognition. This problem is understood as how we figure out other minds, relying only on indirect manifestations of other people’s intentional states, which are assumed to be hidden, private and internal. Research on this question has mostly investigated how individual cognitive mechanisms achieve this task. A shift in the internalist assumptions regarding intentional states has expanded the research focus with hypotheses that explore the role of interactive phenomena and interpersonal histories and their implications for understanding individual cognitive processes. Our social lives are populated by different kinds of cognitive and affective phenomena that are related to but not exhausted by the question of how we figure out other minds. These phenomena include acting and perceiving together, verbal and non-verbal engagement, experiences of (dis-)connection, management of relations in a group, joint meaning- making, intimacy, trust, conflict, negotiation, asymmetric relations, material mediation of social interaction, collective action, contextual engagement with socio-cultural norms, structures and roles, etc. These phenomena are often characterized by a strong participation by the cognitive agent in contrast with the spectatorial stance typical of social cognition research. We use the broader notion of embodied intersubjectivity to refer to this wider set of phenomena. This Research Topic aims to investigate relations between these different issues, to help lay strong foundations for a science of intersubjectivity – the social mind writ large. To contribute to this goal, we encouraged contributions in psychology, neuroscience, psychopathology, philosophy, and cognitive science that address this wider scope of intersubjectivity by extending the range of explanatory factors from purely individual to interactive, from observational to participatory.